Prime Minister Justin Trudeau said today the Trump administration's policy of separating illegal migrants from their children is "wrong," just hours before the U.S. president signed an executive order pledging to maintain family unity. 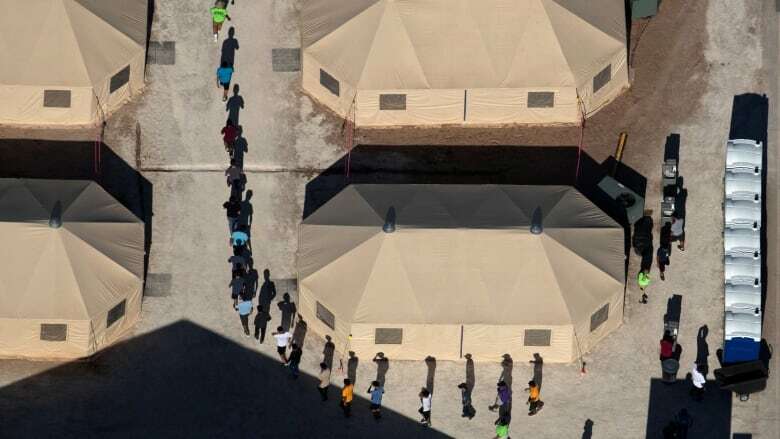 The move came as global outrage continues to build over the Trump administration policy that has led to the detention of more than 2,000 children as their parents are criminally charged. Images of children in cages, sleeping under foil blankets, have sparked condemnation from public figures around the world, including Pope Francis. Retreating from the separation policy today, President Donald Trump said he didn't like the "sight or feeling" of children being taken from their parents. "The border is just as tough, but we want to keep families together," Trump said after signing the executive order at the White House. The order says that it is now the policy of his administration to maintain family unity, "including by detaining alien families together where appropriate and consistent with law and available resources." "It is unfortunate that Congress's failure to act and court orders have put the administration in the position of separating alien families to effectively enforce the law," it adds. Earlier today, Trudeau added his voice to those denouncing the detention policy. "What's going on in the United States is wrong," Trudeau said in brief remarks to reporters Wednesday in Ottawa. "I can't imagine what the families living through this are enduring. Obviously, this is not the way we do things in Canada." When pressed on the issue at a press conference with reporters before Parliament's summer recess, Trudeau called what is happening at the U.S. border "unacceptable." "It's not just me who said it. All kinds of Americans, including Republicans, have said that this is unacceptable," he said. "It seems that they want to change their approach. We hope they'll improve the system, but as far as we're concerned, this cannot last. This situation cannot last." Trudeau's statements today amounted to his first direct criticism of Trump's policy directive. When pressed by the NDP earlier this week, the prime minister called on the opposition to stop playing politics with the issue. Immigration Minister Ahmed Hussen said again today that the government is monitoring the impact of the child separation policy, but also criticized the practice. "It's plainly wrong," he said. Hussen has said that both Canada and the U.S., along with the UN's refugee agency, are conducting ongoing analysis of the Safe Third Country Agreement (STCA), a Canada/U.S. pact meant to stem the flow of illegal migration across the joint border. He said he could not provide any time frame for the review. In the past, the minister has said the 14-year-old agreement — which requires that migrants crossing the Canada/U.S. border make their refugee claims in the first "safe" country they come to, whether it's Canada or the U.S. — is working in Canada's interests but should be modernized. "There have been ongoing conversations at the informal level between our officials and American officials on a safe third country for quite a while now," Trudeau said today. "There's always opportunities to strengthen and improve." The prime minister said Canada has worked hard to counteract the belief that crossing the border at irregular border points is some how a "shortcut" to finding asylum in this country. "They are not shortcuts at all and coming into our country irregularly does not get you around the system," he said. According to data provided to CBC News by Immigration, Refugees and Citizenship Canada, 1,949 asylum seekers were turned back at official border points in 2017 — were refused entry to Canada under the STCA. That's up dramatically from previous years. In 2016, 731 were refused; in 2015, 418 were turned away and in 2014 just 456 were denied entry. The family separations began earlier this year after U.S. Attorney General Jeff Sessions announced a new "zero tolerance" policy of referring those crossing the border illegally for federal criminal prosecution — which results in children being separated from their parents. The policy has renewed calls from human rights groups, refugee lawyers and the NDP to suspend the STCA. Independent Sen. Ratna Omidvar, an internationally recognized Canadian expert in migration, said Tuesday the recent change in U.S. policy has convinced her that the STCA should be suspended. "This new policy of baby-snatching, as some people have called it, has led me to conclude now that the United States is not a safe place for children of asylum seekers, and therefore not a country that we can have an agreement on safety for refugees, " Omidvar said. "However, we cannot simply make a grandiose gesture of cancelling the agreement without backing it up with significant renewal and resourcing of the Immigration and Refugee Board." Hussen has said the Immigration and Refugee Protection Act requires Canada to monitor U.S. domestic policy to make sure that any changes in its asylum system continue to meet criteria for designation as a safe country. Conservative immigration critic Michelle Rempel said she is "deeply concerned" by the reports from the U.S., but said it's up to the government to evaluate whether it remains a safe country for asylum seekers. She said the Americans must answer for their own immigration policies, but Canada must start pushing for stronger laws that would limit the corruption and gang violence that are driving many from their home countries. "Can we always continue to advocate for compassion? Yes. Should we be putting more of an emphasis on Canada pushing back on some of the determinants of migration? Yes. Should we be putting in place a plan to deal with the fact that we've got tens of thousands of people trying to enter Canada? Yes." NDP Leader Jagmeet Singh said the Liberal government should immediately suspend the STCA as the U.S. has made it "absolutely clear" the country is no longer safe for asylum seekers under the Trump administration. He said Trudeau's response took too long and was timid. "To separate kids from their parents is an act that is so deplorable and so inhumane, it speaks to a complete corruption in morality of this administration," he said. "It is just so heinous."